Ole! Late Night Snacking at Ristras! After spending the entire evening bonding with Paul's high school friends, we dropped by Ristras for some late night snacks! We decided to share a Burrito (Php. 340) with our own customized fillings! Paul's side has chorizo red rice with refried beans, pork carnitas, and lots of veggies! My side, on the other hand, has cilantro rice, black beans with lengua and lots of veggies too! Ristras' burrito is HUGE! Thus sharing makes each serving just right. We love our burritos with lots of salsa and garlic cream sauce! Yum! 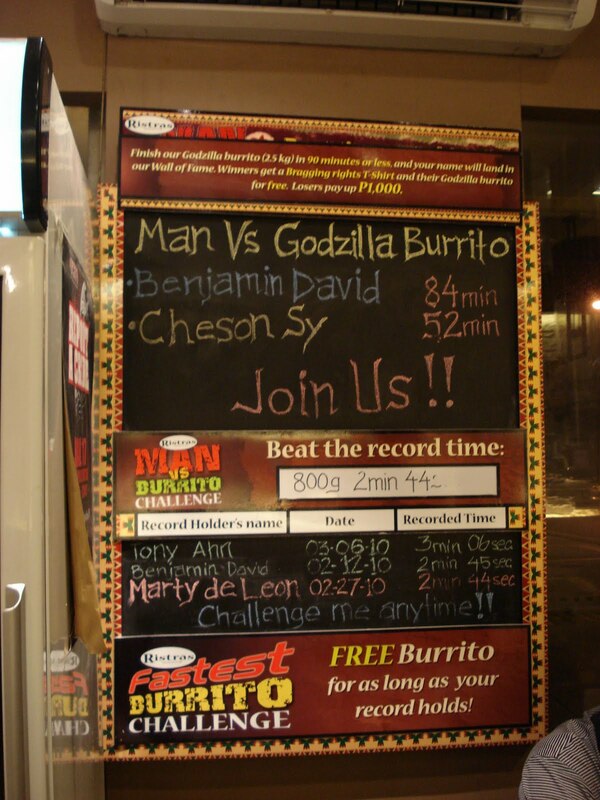 Calling all burrito fans, why not take the challenge as Ristras has an ongoing Man vs. Burrito Challenge. 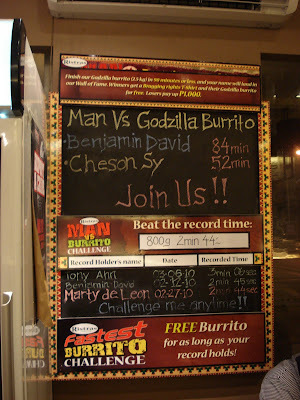 The mechanics is simple, order a Godzilla Burrito (which is 2.5 kg heavy or equivalent to 3 regular-sized burritos) and try to finish it in less than an hour and a half (90 minutes). Successful challengers will get a cool T-shirt, lots of bragging rights and their name on the board! Plus, they do not have to pay for their Godzilla Burrito too! So far there are two names on the board already. :) Come May, all winning participants as according to the server, will have their names printed in a bigger signage to be displayed in front of the store. I'm still convincing Paul to take the burrito challenge! 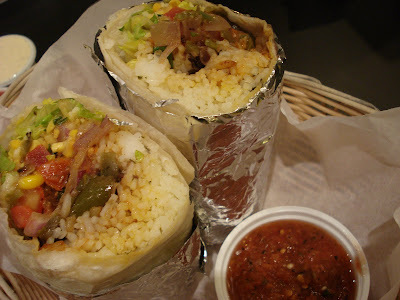 P340 na ang burrito nila? the last time i ate mga december lang ata yun eh P280 lang. bilis nila mag price increase ah.